Get your child organized this back to school season! She'll be able to use this calendar project planner to help her tackle any task her teacher throws her way. She can post her calender on her wall and plan each step of the project, take notes, and even plan out the supplies she needs to complete it. For more back to school help, try our School Supplies or our School Planner. Need a back-to-school planner notebook? Here are some great printables that will help your child stay organized in class! Is your child getting ready to go back to school? Print out these paper dolls to get her in the mood! These sporty name tags are perfect for back to school journals, field trips, first day in class or during parties. Enjoy a cute coloring page to liven your back to school blues! Take a homework break and color, which is actually great for building fine motor skills. Get into the scholarly spirit by completing this back to school word search! Have your child find the words, circle them, and cross them off the list. Complete this fun maze to help this student get to school with all her school supplies in tow. Ready for another school year? 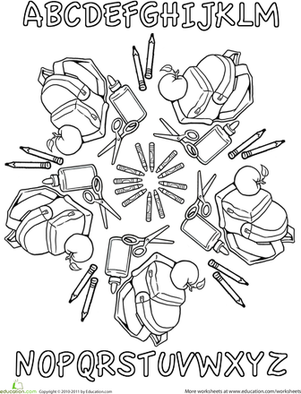 Get pumped with this school-themed coloring page. Cut back on the cost of back to school supplies with these awesome cheat sheets. Your child will be armed with everything from grid paper to rulers! On the first day of school, the class rabbit has hopped out of his cage. Your first grader needs to help this class and find the rabbit. Learn about school uniforms around the world as students are going back to school! Identify National School Librarian Day on a calendar, then create a picture to share with a librarian you know. Teach calendar basics to first graders with this worksheet.